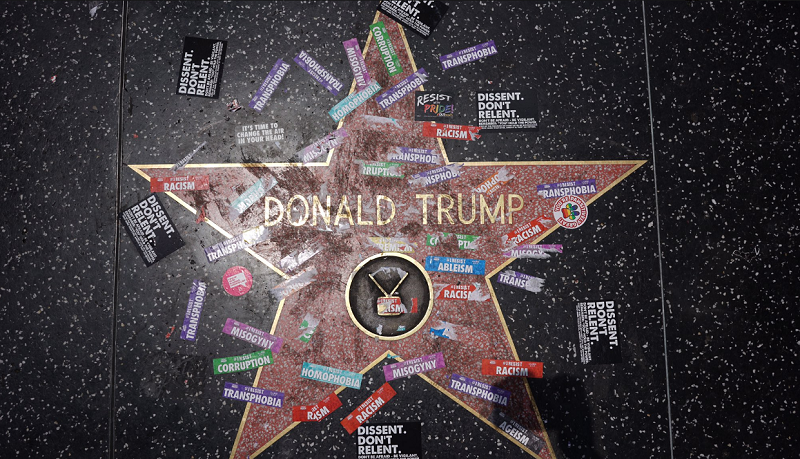 During the Los Angeles Pride march this weekend (renamed the ResistMarch to protest the current administration), Donald Trump’s star on the Walk of Fame was covered in dozens of pro-LGBTQ stickers. As you can see in the photo above, the stickers brandished messages like “Dissent. Don’t Relent,” and “Resist Homphobia/Transphobia/Misogyny/Racism/Ableism”. As you probably know, Trump’s White House has stayed mum regarding Pride, making no official statement to acknowledge the monthlong celebrations. This is in stark contrast to Obama, who commemorated the occasion every year of his presidency. After this weekend I’ve come to the conclusion that a lot of you guys need to grow up. All this whining and “resisting” a president who was elected fair and square is becoming tiring. Trump hasn’t done anything negative to the LGBT community. What are you resisting? That the crook you voted for lost? This is just another excuse to be loud and obnoxious. Ironic, being that actual fascists want to overthrow the government and replace it with a single-party system . . . exactly like the “fascist resistors” of today do. Thank you & exactly. I don’t even bother trying to converse with them anymore. They get so hostile when you question their views, it’s not even worth it. @wagnerwallace & Mo bro (to some extent)..Hasn’t done anything??? You must be living on another planet, or have Stockholm syndrome. The only problem with people (or gays) like you is that as long as it doesn’t affect you, you don’t care about others. The LGBT community represents more than just gays, lesbians, bisexuals, and transgenders. We represent and speak for marginalized community/groups (from other background, religions etc…), which Trump has attacked extensively. As a gay person (that is if you are gay and not a fake troll), you should be ashamed to exploit the gained benefits based on what others have fought for in the past. Both you and Mo Bro aren’t far sighted enough to realize that whatever happens now will affect the future. Unfortunately, you both are just selfish and think that if it doesn’t personally affect you, then it shouldn’t matter (pretty much how Trump/Thiel and this current administration is thinking). Trump doesn’t care about people unless they are rich or upperclass…So yes, there are reasons to ‘resist.’ Your narrow minded views might just limit your ability to see far. Instead of calling me names, saying I don’t care about others, or psychoanalyzing me, why don’t you attempt to prove your point and let me know what marginalized groups Trump has attacked. He may not say everything in the nicest and most flowery terms, but he speaks the truth and says what needs to be said. Immigrants should have come into the country legally. And if you’re coming here from a terrorist breeding ground, you need to be vetted thoroughly. I don’t feel bad about any of this. And once again, back to my previous statement, Trump hasn’t done anything negative to the LGBT community. **Immigrants should have to come into the country legally. Wagnerwallace – you ask what the Cheeto in their has done to directly attack the minorities involved in this act of resistance. How about employing a very high number of homophobes, racists and ignomramists in his team? What about the American Affordable Health Act which is going to massively de-fund many providers of care centered around HIV and AIDS, and also de-fund charities and NGOs who provide services for women – family planning, abortion advice and cancer screening? What about the withdrawal of the advice to schools advising them to allow trans gender pupils to use restrooms appropriate to their gender identity? What about the Religious Freedoms act which pretty much allows bigots to refuse to treat people with respect? I live in the UK and even I can see that the SCROTUS is taking an axe to LGBTQ rights! Gaytaffuk – Unfortunately, the Left has made calling anyone a “racist” or “homophobe” subjective. And just because you declare it, doesn’t make it fact. Can you even give an example of how someone in his cabinet has been racist or homophobic? Healthcare has been a mess before Trump walked into the White House. I pay $400 a month for health insurance I can barely use and I’m a 31 year old healthy man… My only hope is that we can come together and figure out something that works for everyone. It seems like Trump is attempting to fixing it, but every time he does or says anything you guys scream that the sky is falling. In regards to the Religious Freedom Acts… Unfortunately people have the freedom to be jerks. I mean, this article is about people vandalizing a star on the Walk of Fame. There will be jerks for eternity, there’s nothing you can do about it, and I couldn’t care less about them. Just don’t associate with them. Why do you want to? Wagner…I agree: 1) immigrants should come in legally (like I did); 2), if someone originates from a terrorist breeding ground, yes they need to be vetted (unfortunately, not all breeding grounds are weighted equally to Trump’s eyes, especially in places where he has business dealing hint: Saudi Arabia. Why aren’t such countries banned? So that nullifies real Trump’s intention to protect America) To Trump, it’s only dangerous, unless it affects his person interest (which is similar to previous my point that unless it personally affects you, then you won’t care about it. Very Republican and Darwinian). Re marginalized groups in the US, muslims, asians, transgenders…these are some of few groups he has antagonized during his campaign and presidency. There are plenty of examples you could google. While I understands he has his quirks, the presidential thing would be admit fault. Anyway, you can deny what is going on, and cherry-pick the stories that appeal to you. But, you can’t claim that Trump hasn’t he hasn’t done anything negative, especially since he’s associating with religious nuts/Evangelicals that think that gays should be persecuted. If anything, he’s fueling their cause. So yes, he has done something negative to the LGBTQ community. As far as you not feeling bad about this, that’s up to you. But my point stands: until it actually happens to you, you won’t get it and care. Only when you’re affected, will you care as an individual. And that is very selfish. You’re paying $400/month? As a 31 yr old man under the AHCA, that’s a bit ‘interesting’. No job?? Trump’s new health law might exclude you from paying your premiums, but it takes health benefits away from millions that need and can barely afford it. I guess that’s the Republicans’s way to get rid of the weak and stupid. Pretty sad. Alexis – I’m sure we agree on more than we disagree on. My initial point is, that we should be able to be adults and we don’t have to make everyone who disagrees with our opinions out to be a monster. I’m a Republican, I voted for Trump. I don’t think he’s perfect, but I also don’t think he’s Hitler. It’s just so annoying to be gay and have to constantly hear & read that anyone who voted for Trump is just a monster. I think that’s so childish. And yes, I have a job, which is why I can afford the health insurance (even though I think the cost is ridiculous), but my situation is no different from so many other people I’ve talked to about it. Thank you for that bit of honesty! With my gay brothers and sister. No facts, just spewing hatred. Surely they remember what that is and what it can do. Wagnerwallace – Homophobes/racists in Trump’s team – let’s start with Mike Pence who introduced legislation in his home state which very clearly discriminated against LBGTQ people, he believes in conversion therapy. Betsy Devos (not sure of her name – in charge of education) a well known homophobe who financed a number of anti gay organisations and blamed other family members (didn’t even have the guts to own it). Sessions – attorney general a well known racist who has used racist slurs and was precluded from a judge’s position due to it. Healthcare – when 23 million people could be thrown out of healthcare (maybe even you) you should be VERY concerned about Trump’s attempts to ‘fix’ healthcare. I can see that it wasn’t perfect before but it seems his attempts to ‘fix’ it are ‘fixing’ it to provide obscene profits for his friends in healthcare provision and insurance, as per Trump looking after his own! Religious Freedom – as far as I can see Americans have religious freedom, this bill is more about the freedom to discriminate. People will be jerks but surely the point of any religion is to treat ALL people with respect regardless of gender, sexuality, race or religion. Does the Religious Freedom Act allow Muslims not to bake cakes for Christians? Yes, this article is about vandalising a sign but their actions are indicative of their strength of feeling about being separated from society and treated as ‘others’ by a ‘president’ and his team who were elected to represent ALL of the American people, equally and without prejudice. It is the very least he deserves! @wagnerwallace Barely one hour after Trump took office, whitehouse.gov/lgbt was replaced by a Trump “transitionsplash” page. Five months later, that “transition” page, and, no, the irony does not escape me, is still up. I believe the day one, or rather, the hour one erasure of the LGBT page from whitehouse.gov speaks, literally and metaphorically, as a perfect example of Trump’s doing something “negative to the LGBT community.” And for the record, this comment is presented without hostility; and was typed neither loudly or obnoxiously. I’m sorry, but I just can’t take you serious when you bring up Mike Pence, conversion therapy or Betsy Devos’ alleged donations, because the candidate that you guys would have loved to have seen as president accepted money from pro-Sharia Law countries who literally throw gays off of buildings and stone women. But she was an ally and a feminist? Give me a break. And I saw so many gays holding up signs that said things like “We’d be at brunch if our girl won…” Why is that? Why is it only unacceptable when someone on the Right slights the LGBT community, and not when someone on the Left does it. That’s hypocritical. I don’t condone any of it, but the other option wasn’t any better either. Once again, healthcare is being worked on. The Affordable Care Act is new. People weren’t dying in the streets before it came about. The sky isn’t falling and a solution is being worked out. The Religious Freedom Act does covers Muslims, since that is a religion as well. And quite frankly, I wouldn’t even want someone who disagrees with my existence to bake my food. You can’t force someone to accept you. There are plenty of lovely, religious and non-religious, people who’d love the opportunity. Let’s keep these people in business. No one is separating you from society or treating you like an “other”. That is the exact victim mentality that is fast-flowing on the Left. Wagnerwallace – of course the actions of Pence, Devos and Sessions are relevant/important. They speak tongue direction the government is taking – it’s direction of travel. This is extremely important as is speaks to the ‘flavor’ the government is adopting and the taste of this government is overwhelmingly bitter. You only need to look at who SCROTUS was talking to at the Faith and Freedom Coalition – do you think those people support LBQT rights? Was he there to change their minds? No, he was not, and he was there to support the rest of his very shifty teams beliefs. He would appear tonnage no beliefs of his own but is quite happy to get into bed with anyone who will support his agenda which is to make more money for brand Trump. When you criticise Clinton it is difficult to take you seriously too. Yes she is/was a flawed candidate but no-where near as flawed as SCROTUS. Do you really think she would have dragged the US kicking and screaming out of the Paris agreement? Would she have refunded Trans bathroom rights, would she have enacted a Travel Ban, would she have attacked Syria and blown up a shed and not materially have affected the activity of the targeted airport? No, I don’t think so! The other thing to think about is how cosy SCROTUS is with the Saudis at the moment, lots of weapons being sold there, supporting them against Qatar, not exactly keeping his distance! Healthcare – what is this magical solution the Republicans are working on? They have gone suspiciously quiet on this? Will it resolve all of the issues the AHCA had, I seriously doubt it. The only way to resolve the health care problems America has is to adopt a system similar to that used in the UK ( though that’s not perfect it’s a lot better than the US) or Canada or Australia. Religious Freedom – yes there are Muslims who do not like LBQT and they should also have restrictions placed on them, any extremist religion should – including extremist Jews, Muslims and Christians in this, any ‘religion’ with extremist views should not be given the right to discriminate. Also, as I understood it, I thought there was supposed to be a decision of state and religion – it looks as if that is being seriously eroded by this government. The fact that LBQT rights are being undermined and, probably in the long term, overturned, means that LBQT are being separated from society and treating us as ‘others’. That is not ‘victim mentality’ that is what appears to be happening. Re your last comment wagner: yes, I do think that many of us in the community have more in common and agree on more things than we disagree on. As for gays who voted for Trump, I definitely don’t think of them as monsters. I am just disappointed with them, and can’t understand how such people, i.e. a gay men, voted for someone who supports a party that has marginalized your own community demeaned your own sexuality. Now, I understand that being gay doesn’t define you..but it’s not how the rest of society sees it or you. And, you probably just haven’t felt the discrimination as others. Based on my encounters with gay men that voted from Trump, the consensus has been that most of them are upper-class single (often closeted) gay men, who don’t really care about being a relationship or having a partner/family (but hook up a lot) but mostly care about how to enhance their stock portfolio so that they can save for their own retirement (often because they lack a family). Now I am somewhat generalizing, but I am pretty that this trend has some truth. Anyway, it’s true that people have become a bit too childish as a result of Trump and his behavior. However, you need to put this into context. Until Trump stops acting like a kid and start acting more presidential, people won’t stop criticizing. Also, given his history on how he treats others, he sure can dish the hits out, but can’t take them. I think you need to realize the source of the frustration. To date, Trump has done very little to be taken seriously. So yes, people are childish, but so is he. I like to be hopeful, but the evidence shows that je and his family are very corrupt (more than the Clintons). I don’t understand how people like you can overlook this or the injustice, and think that this corruption and behavior should be treated as normal; and that people should support Trump regardless of that…nan, sorry that doesn’t fly. Whomever may find this empowering rather than embarrassing is only promoting the notion that we, as a group, cannot rise above childish tantrums and vandalism to convey a political point. Unfortunately, that’s the new normal that Trump has set, and only understands. In order to get to a child, you have to speak like one sometimes. That is so weak a statement I can’t fathom a response that you could possibly comprehend. That’s as rational as people claiming Trump has made them gain weight. Or lose weight. Or lift weights, I don’t know, I can’t keep up anymore. What a load, this thread. Is Trump hiring psychology students to ooze onto the net and attempt to sway the gay? gag. Let’s not get stuck on the clown. Focus on the Republicans who are complicit in this travesty of an administration. What is happening with that promulgation (herd name) of Goldman Sacksters Trump ushered into the hen house? Please abolish the Electoral College so America can see a purpose to go out and vote. This past election it became clear that the popular vote does not matter. Our votes don’t count. Honestly… I appreciate the emotions behind these actions, but every time I look at that star covered in stickers I feel bad. Not for Donald Trump… his actions coupled with his celebrity and political status make him more than deserved for this kind of outcry. Rather, I feel sad for the employee charged with scraping all that junk off the star. Because at the end of the day that job likely fell to some underpaid employee whose sole exposure to Pride is having to clean up someone else’s mess. Not for long. Trump’s budget will have these stewards of his star standing in soup lines by the end of the year given his budget cuts. The wealthiest must have more. I heard dogs and people have urinated on it, defecated on it, and had other bodily fluids spilled on it. Maybe they should have it removed or paved over it. At least they didn’t try to burn down any colleges this time. Lucy Ricardo and Ethyl Mertz stole John Wayne’s star back in 1956. I guess that was a hate crime against John Wayne? The behavior is wrong. Were gay sites vandalized by bigots, I would be incensed. Find another, more mature, legal and political way to deal with this heedless hack, despite inexorable impulses. First I’m surprised 45 has a star there. Second, I think a big steaming pile of dog excrement would be nice on it. Must be steaming to make people gag. Also, has anyone noticed he’s not orange anymore? And last, I think kathy griffin decided to soon to apologize. It wasn’t funny it was a bad joke but when she said 45 broke her, big mistake because that let him get his way, his family attacked her. I think if she had handled it like Joan Rivers who never apologized, she would have recovered. Maybe not right away but that apology was wrong for a comic, she exposed her belly and everyone went for the gut. If he goes to prison or is just fired or found out and is censured, ANYTHING, she will look back and regret apologizing. So this is acceptable behavior, but it’s terrible when a gay person’s home or car is defaced by homophobic graffiti? Some people just need to grow up. Sadly, I’m beginning to believe that petulant, immature, anarchistic behavior has become the norm for many people who have no specific objective, merely anger. @ Mo Bro The mentality seems to be: if we get angry enough and throw tantrums, break windows and deface property, maybe Trump will resign, be impeached, or be assassinated. @Kieran. The left has created a monster they are going to regret (if they don’t regret it already). When they “get angry enough and throw tantrums, break windows and deface property”, they are only enforcing the resolve of the Trump side. The hissy fit crybaby left is making the Trump camp stronger, more resolved, more dug-in, more determined than ever. So, thank you to the left, you’re doing a great job of supporting the Trump campaign of 2020. Don’t change a thing, we love you just the way you are. It’s going to be a great re-election. I am just so glad that no one vandalized the star with paint or such. Protests should not damage property, regardless of whose it is. It is one of the issues I have with the BLM folks. Seems like every time they show up there is looting and burning of people’s property. I am glad we did not stoop to that level. I was sitting in a crowded doctors office waiting room on Friday when Trump’s news brief from the whitehouse lawn came on. Ages ranged from early thirties to nineties. Everyone, and I mean everyone, started commenting on him. Not one person gave him any support. It ranged from he’s no President, he’s a joke, he’s not for the american people, he should be impeached, to a few older women saying he should be assassinated. If he’d stopped in there for a surprise presidential visit I doubt he’d have walked out of there alive. And they’re right, that piece of uncultured trash is no president. His star should be removed, so a little vandalism is fine with me. Prax07, don’t forget to show up for Pride and be first in line at the parade to call for fairness, respect, tolerance, equal rights, dignity, etc for LGBTQ people. However, when the rainbow flag gets ripped out of your hands and someone shuts you the fu*ck up just remember when you said “a little vandalism is fine with me”. You stupid hypocrite. Sounds like you live in a nice, comfy bubble where no one disagrees with you. ..and for any LGBTQ people that Voted TRUMP…GO PHK Yourselves! …you should be SHUNNED….go PHK yourselves and fellow GOP ASSHOLES…. @mediaguy I’d be fine if someone put a shotgun in Trump’s face and pulled the trigger, so yeah, a little defecation or stickers on Trump’s star is also really fine with me. @mobro It was indeed nice to sit in a room full of strangers and find out they all feel the same way about that piece of garbage calling itself president.